Romy Phillips, international yoga teacher and author, is teaching a dynamic workshop on how Yoga can work on a cellular level to improve health by directing the practitioner in focusing on specific parts of the body that soothe and relax the mind. Yoga will not only strengthen and physically aligns the body but also has a physiological effect in balancing the primary systems of the body — such as the circulatory, nervous, hormonal, digestive and more. The diaphragm in yogic science is the seat of intelligence of the heart and the window of the soul. Stress makes it hard to move the diaphragm and therefore difficult to breathe. Yoga asanas develop elasticity in the diaphragm to help prepare the body for Pranayama (Prana--"life force, energy" ayama---“storing, distribution of energy. Although there are many pranayama techniques with specific attributes, the primary benefits tone and calm the nervous system and increase the flow of oxygenated blood to the tissues of the body. This results in—cleansing and purifying the body, balancing energy levels, alleviating stress and regulating mood (depression). Both yoga and pranayama can support a meditation practice. When the active mind quiets down, you become more aware of the sensations you’re feeling in your body, the sound of the breath, and create distance from distracting thought patterns. In all, you will experience a renewed sense of energy and improved clarity of mind! Romy is a certified yoga instructor and yoga therapist who has been teaching since 2001. She has studied many styles of yoga but primarily practices Ashtanga and Iyengar. She teaches group classes regularly and leads teacher trainings, workshops, and intensives in the United States and internationally. Anatomy, kinesiology, and injury management are the highlights of her trainings. She currently teaches at YogaWorks in Maryland has taught at various studios in Los Angeles (YogaWorks and Santa Monica Yoga) and also in numerous cities throughout Japan, China, and Vietnam, including Tokyo, Osaka, Beijing, Shenzhen, and Saigon. Romy has a BFA (Maryland Institute, College of Art) and MFA (Columbia University). She has completed several yoga teacher trainings, including Anusara, YogaWorks 200HR (with Lisa Walford and Birgitte Kristen), and YogaWorks 300HR (with Birgitte Kristen, her mentor). In addition, she has attended numerous workshops and intensives with leading practitioners in the field and has completed anatomy studies at UCLA. 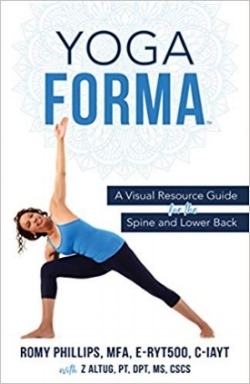 Romy will be introducing her new book during this workshop, which reflects her years of experience in movement through dance (ballet, modern, and jazz) and yoga - "Yoga Forma: A Visual Resource Guide for the Spine and Lower Back" (Plain Sight Publishing, 2018).